Braised Green Beans with Tomatoes is a tasty Turkish style vegetarian recipe. It is an outstanding combination of simple ingredients. Just use good olive oil for this. It’s ready in 30 min and will be your ultimate side dish. This Braised Green Beans with Tomatoes recipe is from Turkish cuisine. It is one of those simple dishes everyone knows in the country. There might be variations in its cooking, but the taste is almost the same in the end. I know it looks and sounds simple –it really is but I must tell you that you will be amazed when you taste it. This simple dish is always one of the favorite dishes of our American friends when they visit Turkey. They say it would be a perfect side dish on Thanksgiving table although we mostly have green beans with tomatoes as the main course. Just like in Okra With Tomatoes Recipe, which is another perfect summer dish, good olive oil and good summer tomatoes do the work here. So choose your favorite products when you decide to make braised green beans with tomatoes. I used to think that everyone around the world eats green beans this way until several non-Turkish friends asked for the recipe. As far as I know Greeks have a similar recipe as well. 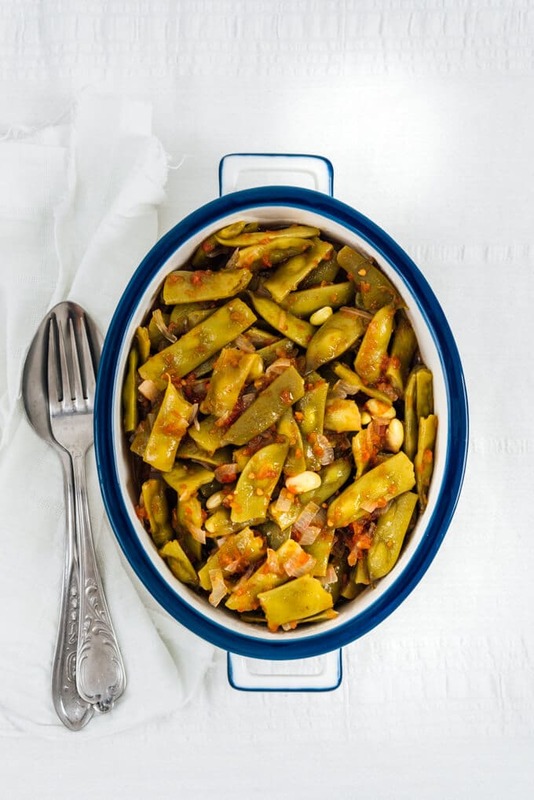 As seen on Pinterest, green beans are mostly blanched or roasted and served as a side dish, so this Turkish/Greek style green beans might sound unusual to most of our readers. Don’t make your mind before tasting, I promise you will LOVE it! What’s more, it will become your favorite green beans recipe! Besides the scrumptious taste, the best thing about green beans with tomatoes is that it requires very little work. Just chop everything, toss in a pot. Drizzle olive oil over it, sprinkle salt and black pepper, pour ½ cup water and cook covered over medium low heat for 30 minutes or until tender. Easy peasy, isn’t it? Finally, I must tell you that cold served braised green beans is one of the best companions for Turkish raki, which is the Turkish national alcoholic drink. It’s similar to Greek ouzo and served with mezzes like this. If you happen to visit Turkey one day, you must try these two! So if you haven’t tried green beans with tomatoes yet, it’s the time now! I know everyone in the family will ask for more. We mostly chop green beans for this recipe, but it’s okay to leave them as they are. Just trim off the ends. My way of making this recipe is slightly different, yet easier than the traditional way. Traditionally, diced onion is cooked in olive oil, green beans are added and cooked for some minutes. Then add tomatoes and cook until almost tender. When there is little juice left in the pan, pour water and keep cooking until beans are tender. After trying two versions, I didn’t see any difference in the taste of final result. That’s why I prefer putting everything in the pan at the same time, as you see in this recipe. Cooking duration of this recipe might be different depending on the type of the green beans you use, so check it after 20-30 minutes. Keep cooking if they are still crispy because the green beans in this recipe are supposed to get tender. Don’t worry, the beans won’t get soggy even after 30 minutes. An outstanding taste with simple ingredients like green beans, onion and tomatoes. An amazing side or vegetarian main course. Put half of the green beans in a pan. Toss in diced onion and then the rest of green beans. Add diced tomatoes over them. Drizzle olive oil and add salt, sugar, black pepper and water. Cook covered over medium low heat for 30 minutes or until tender. Optionally, drizzle 1 tablespoon olive oil right before serving. We published this post in 2015 and we’re updating it today with new pictures and additional information. Thanks Makos! Simple but incredibly tasty, isn’t it? Thank you Mariam! The way you describe it makes my mouth water. Love the idea of pita and raw onion. YUM! Hi Ayse! It is a simple yet favorite summer dish of all of us, isn’t it? I know the produces there might be different from the ones in Turkey. Are there any farmer’s market in your area? Maybe you can find it there. I’m not sure though whether you can find Ayse Kadin beans there if that’s what you’re looking for 🙂 Best! Hi Rita! Turkish and Greek cuisines have a lot in common and this recipe is just one of them. Probably you know tzatziki from Greece. We have the same dish with the name of cacik. A lot more examples like this. 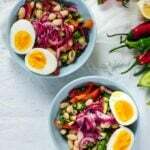 Happy to hear that you love this green bean recipe. If you have any questions about any recipe here, feel free to ask me. Cheers from Turkey! Hello again! Just letting you know that I just featured it this morning in my 25 Deliciously Healthy Low-Carb Recipes round-up. Hope a lot of my readers will come over here and check it out! I had this in Turkey, and it was fantastic! Yes, I remember that Kalyn. You see, how easy it is to make it. Hi Adina! Happy to remind you your grandma’s dish. They always know better and more than us, don’t they? Hope you like my recipe as much as your grandma’s. Cheers! I would LOVE this as a main course! Hi Sue, I don’t need another dish when I have this amazingly tasty green beans indeed.